K100-forum.com » Technical, repair and troubleshooting » Electrical » Electrical question Choke wire? 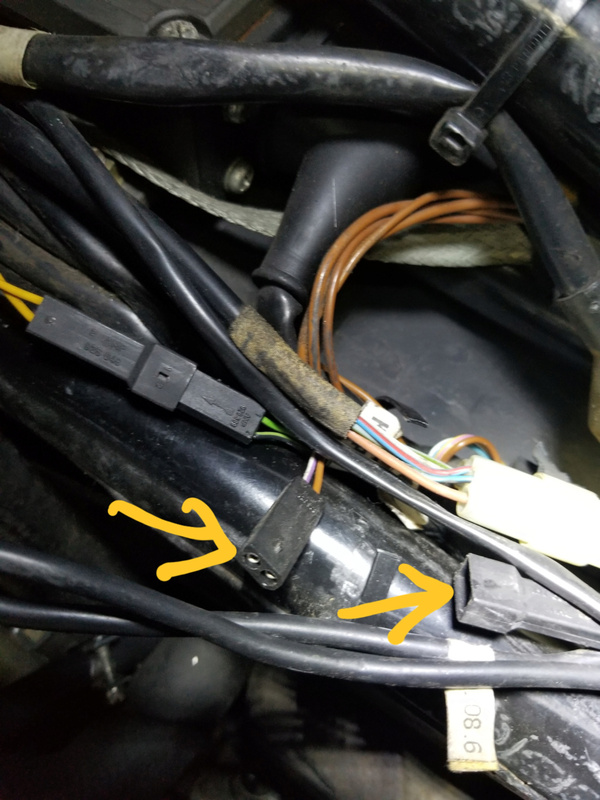 I was tracing the wire for the power outlet in the dash (removed gas tank) Got to the bundle and while loosening it all up, i think I disconnected this wire. (see two arrows) The male side says 'choke' on the paper tab. Did it unplug from the right arrow? I didn't think I unplugged anything, but it seems this came apart, though I don't want to plug in if it's supposed to be disconnected. I don't have a specific answer to your question but if nothing has been changed from original then the colour of the wires and the specific sockets will tell you a great deal. The wiring schematics in the tech pages have all the information you need to be able to identify everything. BMW used a lot of different sockets and I would say that it would be hard to get the wrong things plugged in to each other. Others will be along to give you a really specific answer though I'm sure. What year is your bike? If it's 91 or later BMW stopped installing theTB switch for the choke light in the instrument cluster so the wiring labeled choke is not connected to anything. It could also be clutch switch wire as its the same switch on 2v. @92KK 84WW Olaf wrote: It could also be clutch switch wire as its the same switch on 2v. It is a good idea to label the loom side of the plug connector. @92KK 84WW Olaf wrote: It is a good idea to label the loom side of the plug connector. Not sure what years but on some US bikes BMW labeled them in English at the factory. Your left arrow is the connector for the yellow choke indicator in the cluster. If you follow the wiring from your right arrow it should end up at a switch on the rear of the throttle bodies if it's the choke indicator switch. Duck, I went back and looked at his intro. It's an 87 K100. This is an example of members needing to put the bike's specifics in their signature line so we're not guessing when asked. Thanks, perfect, I will trace it on Saturday. Sorry, just joined last week, I'm new here. I will take care of that now. Edit: Weird, other forums when you add/ change signature, it updates all posts. Thank you everyone, now my choke indicator works! Dash socket still isn't live, but tested wiring previous owner had (for his last decade charging) and it was live, so going to use that. » Electrical Question? Can I do without a regulator?